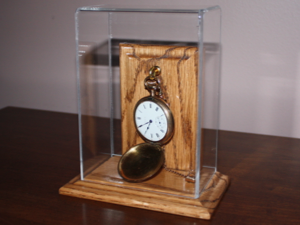 Our custom display cases feature an all acrylic cover on top of an oak base. 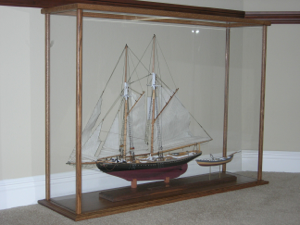 Our model display kits feature oak trim on the top and vertical corners including an oak base. 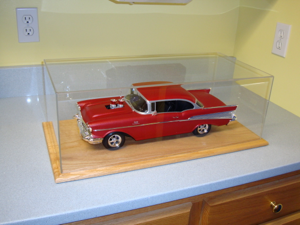 We make a variety of display cases for all your memorabilia needs. Ron, the case arrived today in perfect condition. The workmanship is very well done especially the delicate work of forming the acrylic edges and joining corners. Spectacular! I inserted the yet to be finished model of the Battleship Missouri and it immediately gave me a sense of what the total presentation will be like. It encourages me to build in even more detail into the model itself. Thank you for the prompt and professional service. I have a collection of Brass locomotives that I will be asking you to build cases for soon. I look forward to the relationship. My grandchildren will thrilled once they start receiving these presents over the next years! Ron built me a custom made all acrylic display case with a solid oak base according to the dimensions I needed and I couldn’t be more satisfied. The acrylic is optical quality and fits perfectly to the base. The price was also very reasonable. I ended up paying about half of what my other custom cases cost from another builder. His fast and friendly service made the entire transaction enjoyable. Ron is going to be building all my cases from now on. I looked over the cases yesterday and they were perfect. It’s especially good because I got similar cases from other guys ( I won’t mention names) but it took ten months to a year to get theirs, even after repeated complaints. And your prices matched theirs — without the aggravation. And your quality outstripped them. I will definitely be back. I just received my case, and it’s perfect, exactly what I envisioned! It came through in perfect shape – that was one of the most careful, precise packing jobs I’ve ever seen. It reflects the caliber of your work and, I hope, your pride in it! Thank you so much! Ron, the case arrived today in perfect condition. The workmanship is very well done especially the delicate work of forming the acrylic edges and joining corners. Spectacular! Thank you for the prompt and professional service. My grandchildren will thrilled once they start receiving these presents over the next years. The case arrived today and it looks great! As always, the last two cases I got were Perfect and truly enhance the models–could not be happier! I am hoping that showing some more Planes and Cars will entice some of your other customers and new ones to decide to protect their “prizes” and order some more cases from Grandpa’s Cabinets. Thanks for building such a beautiful case to house my 18th scale P-51 D and my F-6F Hellcat. The cases you build really look great and surely protect many months worth of work–truly the best cases I have seen! Thanks again for making my ship model look really professional. Everyone who has seen the case and the ship are really impressed. The case looks great and the total effect of the display enhances the model. It looks like it should be in a museum!